Tioga Pass is the section of Highway 120 than takes one from the eastern side of the Sierra Nevadas on Highway 395 up and over to Yosemite on the western side of the mountain range. 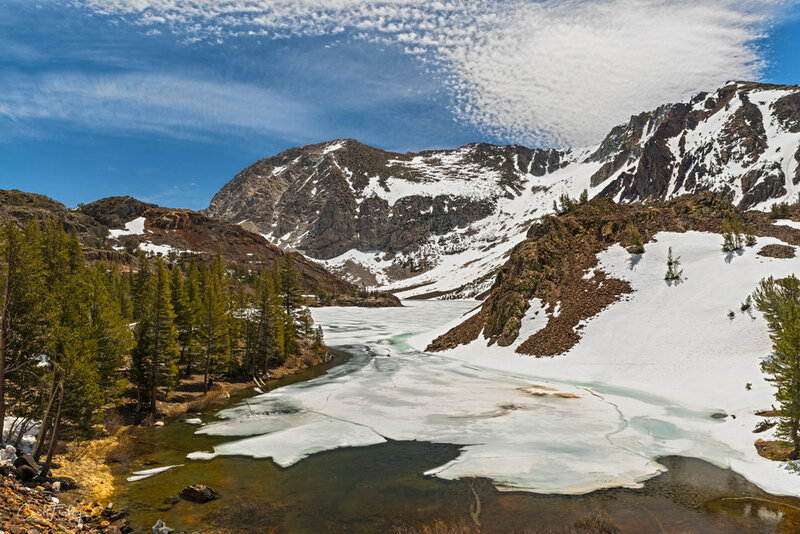 Tioga Pass is only open from late May through October, weather permitting. 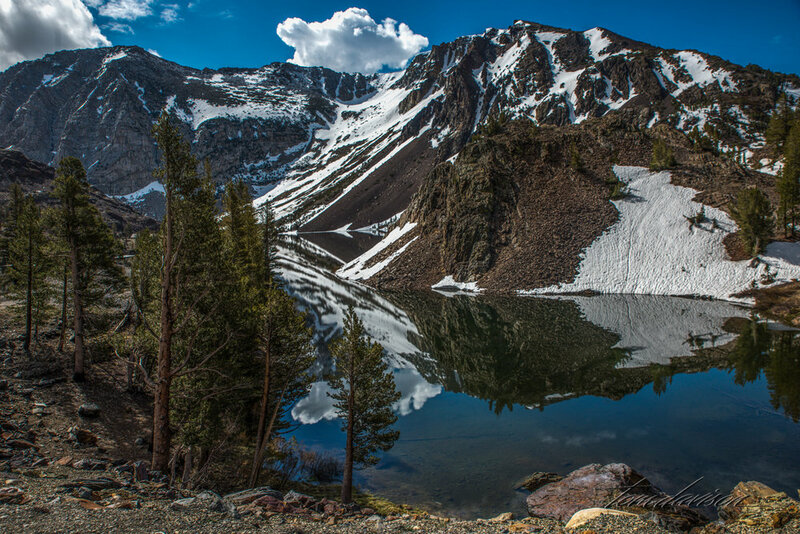 Tioga Pass is one of three roads that crosses the Sierra Nevadas, allowing access from eastern and western sides of the mountain range. From Tioga Pass all the way to the south of Mt. Whitney, no other roads cross the High Sierra. Tom and I drove up as far as the Yosemite Park entrance which was closed at the time. Later we met up with a fellow Nikonnian and went as far as Olmsted Point but did not photograph Toloume Meadows. We later returned with Diane and captured even more of the magic of this Pass.. This is a collection of photographs from all three trips. On our first trip, the lakes were still partially iced over. This is a huge waterfall! You can hear from miles away. Taken at Olsted Point. The iconic granite Half Dome is visible in many areas of the park, but we pulled over here to get a different view. 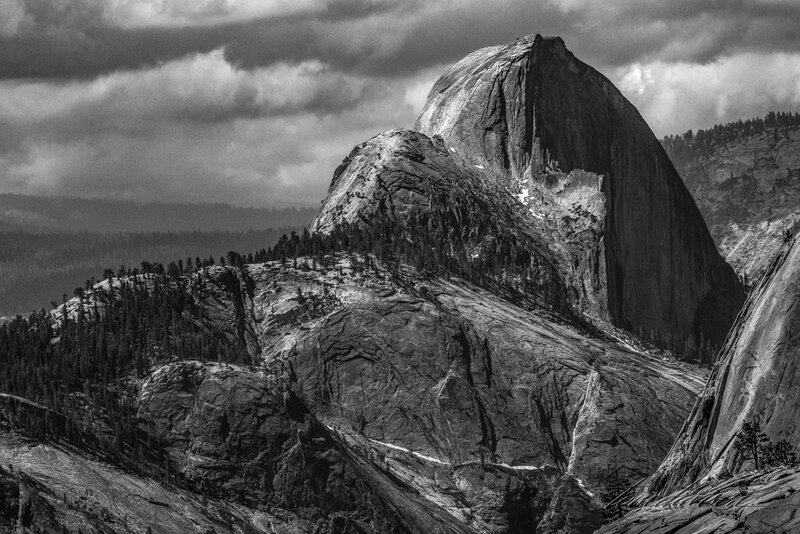 To the left of Half Dome is the northwest face of Cloud's Rest at 9,926 feet above sea level. Its face drops nearly 5000 feet to lower Tenaya Creek. One the most important features of this area of the Sierras is the great amount of granite. You can see it in the very smooth, treeless, gray colored mountain faces. Trees do their best to make use of small pockets of soil. In the distance you can see Tenaya Lake. Tenaya Lake from Olmsted Point. Diane could imagine this being a board game for giants! Tenaya Lake is easily accessible from the road. Trees trying the thrive on a granite mountain. At 8,600 feet Tuolumne Meadows is one of the largest high-elevation meadows in the Sierra Nevada Mountain Range. 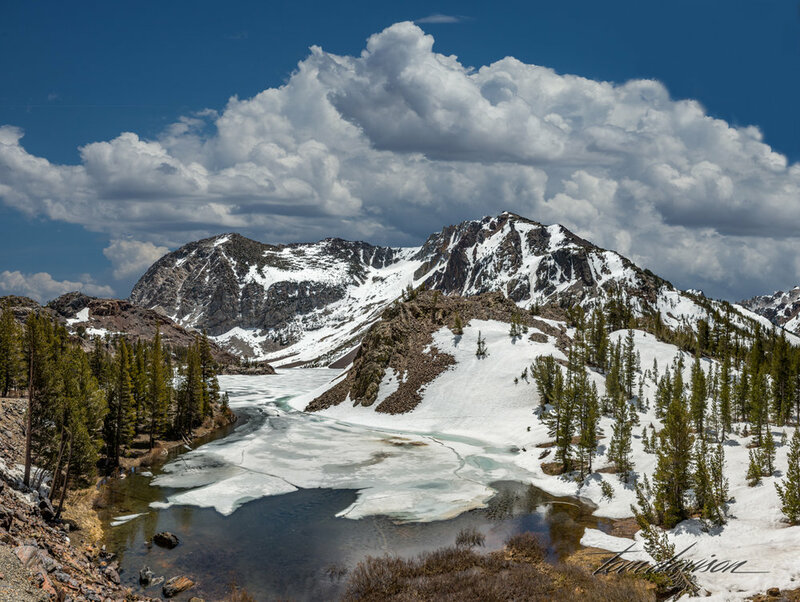 Water sources for the meadow include two forks deep in Yosemite's wilderness—the Dana and the Lyell—and include three creeks—Budd, Delaney and Unicorn. 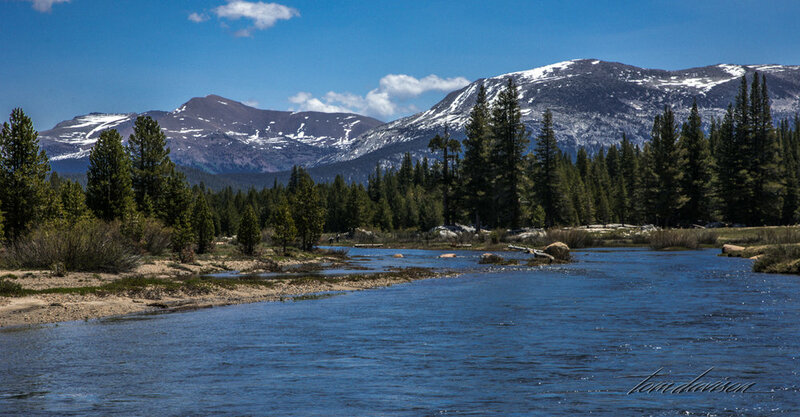 The Tuolumne River runs through the middle of the meadows, for three miles, and is supplied by snowmelt and hill-slope aquifers. In spring as soon as the snow melts, it is not uncommon to see large areas of the meadows flooded and practically transformed into a lake. Most of the water that filters through Tuolumne Meadows is collected in the Hetch Hetchy Reservoir and then becomes an important source of drinking water for San Francisco. On our way to Olmsted Point, Diane spotted a small lake that had interesting rocks spread about. We looked for it on our way back down the hill. She was correct. It proved to be an interesting stop. Well, we went up so we had to go down. Great road trips, all three.